I am back to reading Lotten’s letters. Lotten, Augusta’s friend from school, wrote long letters to Augusta, updating her on the latest gossip from Stockholm. Mrs. Edgren and her husband operated a school for girls in Stockholm between 1838 and 1844. Some students, like Augusta, boarded with the family Edgren. Mrs. Edgren was from Germany and her sister, Mlle. Dethmar, also lived with them. When the Edgren school closed in 1844, many of the students, including Augusta, transferred to Mlle. Frigel’s school. So who were the two girls, rumored to be engaged? Mlle. Schwan must have been Elisabeth Schwan, born in 1828. She married Knut Cassel in 1850. Mlle. Sjöstedt must have been Augusta Sjöstedt’s older sister Ophalia Carolina Göthilda, born in 1826. She married Georg Julius von Axelson in 1850. If they both married in 1850, would they really have gotten engaged in 1846? Maybe the rumors were not true at all. But who were Augusta’s and Lotten’s friends – Emma and Ebba Almroth? From Lotten’s letter above, it is clear that they first studied with Mrs. Edgren and then with Mlle. Frigel, just like Augusta. The view from Almroth’s apartment at the corner of Klara Västra Kyrkogata and Stora Vattugränd. 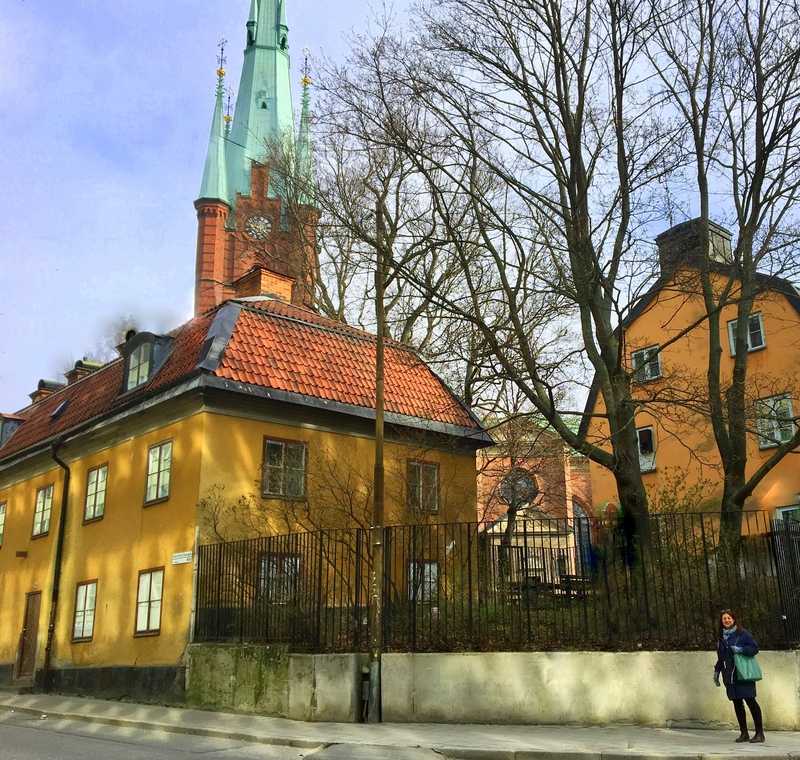 To find Emma and Ebba, I start with the 1835 census records in Stockholm. I find the Almroth family right away. Emma Almroth was born in 1829 and Ebba was born in 1831. They also had an older brother, Nils Leo, who was born in 1824. The family lived at House No. 11 on Klara Västra Kyrkogata, a block away from Mrs. Edgren’s school. Was it true? Yes, but with the exception that they were not nurses but rather Christian volunteers. I remember very little from my history classes about the Crimean War and what Florence Nightingale actually did. Time to read up on the Crimean War. Thanks to the Christmas present from my son this year – a massive book on 100 years of European history from 1815 to 1914, I find what I need. Thanks Jonas! The Mission of Mercy: Nightingale receiving the wounded at Scutari. Painting by Jerry Barrett, 1858. The Crimean war started in the fall of 1853 and ended in February 1856. 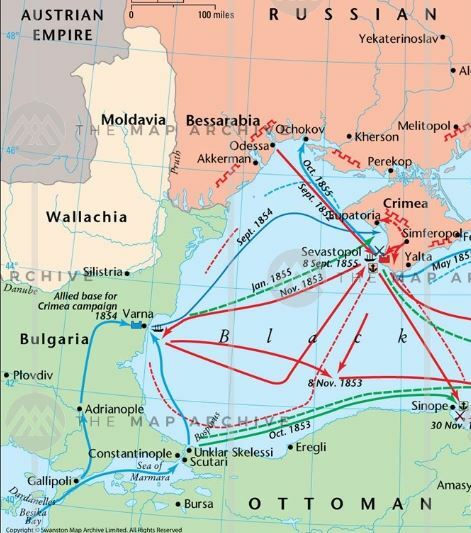 Russia, wanting more influence over the Balkan and ultimately access to the Mediterranean, invaded what is now Rumania, which was then under Ottoman control. Together, France and Britain saw the Russian expansion as a threat to the trade route to India, the power balance in the Mediterranean, and the control over the Church of the Holy Sepulchre in Jerusalem. In March of 1854, Britain and France joined the Ottoman Empire in declaring war on Russia. France and Britain decided to attack Russia by invading Crimea. 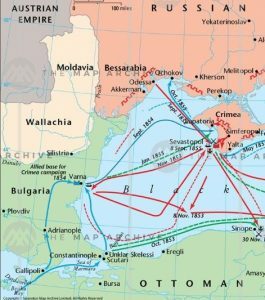 The aim was to destroy the Russian naval base at Sevastopol, thus reducing Russia’s naval power in the Black Sea. This strategy was also advantageous as France and Britain could easily send troops and supplies by sea. There were, however, additional military attacks on Russia elsewhere. For example, British warships entered the Baltic Sea and bombarded Bomarsund’s fortress on the island of Åland which at the time was under Russian control. 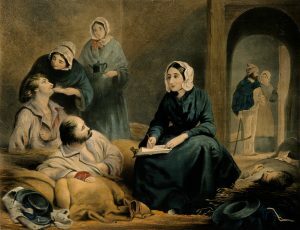 Detail showing Florence Nightingale, some other women, and a wounded soldier. The Crimean war turned out to be a war where more soldiers died from disease than from battlefield wounds. It is estimated that out of the 258,000 soldiers who died during the war, 148,000 or 57% died of disease. Hospital conditions were horrific and the British military hospital in Scutari (Üsküdar) was overcrowded with sick and wounded soldiers. The London Times had a local correspondent who wrote about the incompetence of the staff and the outbreak of a cholera epidemic. 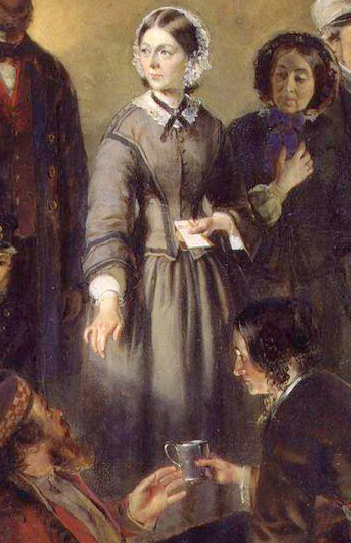 Back in England, one of those who reacted to the news was 34-year-old, Florence Nightingale. On the 21th of October 1854, she and a staff of 38 volunteer nurses left Britain for Constantinople (Istanbul). A simple Google search leads me to a book written in English by Ebba Almroth: Sunbeams on my Path – or – Reminiscences of Christian Work in Various Lands. My father took great pleasure in the education of my sister and myself. We attended the school of Frau Edgren, a German lady, wife of an excellent Swedish clergyman. I almost jump out of my chair when I read Ebba’s description of Mrs. Edgren and her school! A published eyewitness account of Mrs. Edgren’s school! Ebba’s biography continues with the events following her father’s death. A note in the local newspaper about the Almroth sisters leaving for the Crimea. 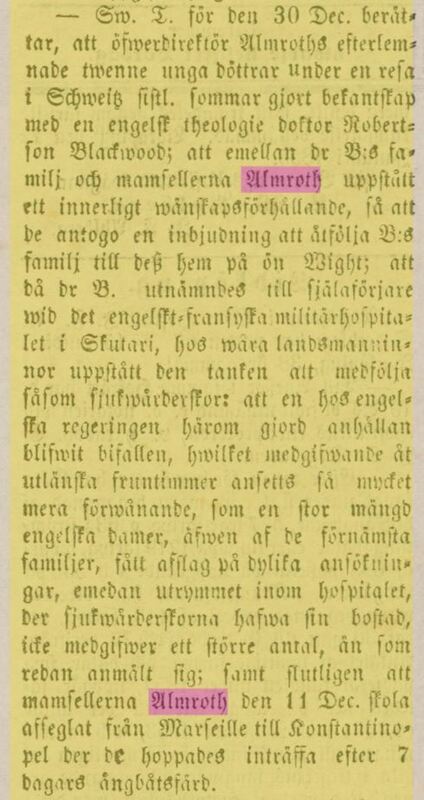 (Linköpings Tidningar, 20 JAN 1855. A French pastor visited the sisters and invited them to visit the Free Church of the Canton de Vaud in Lausanne, Switzerland. They left Stockholm in May 1854. In Lausanne, they met a British couple, the Rev. Dr. Blackwood and his wife, Lady Alicia Blackwood, who invited them to England. And so, in August of 1854, the sisters traveled with the Blackwoods to England. The same fall, Dr. Blackwood was appointed as Army Chaplain for the Hospitals of Constantinople and Scutari – the Crimean war hospitals. Ebba and Emma Almroth decided to accompany the Blackwoods and help out with the work among the sick and wounded. They left on the 6th of December 1854 and sailed from Marseilles to Constantinople where they arrived a few days before Christmas. 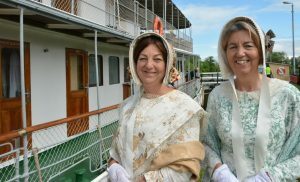 Florence Nightingale and her staff had arrived just a month earlier. 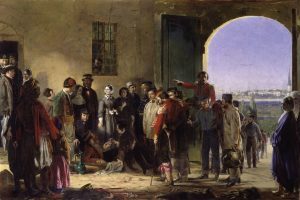 The hospital in Scutari received wounded soldiers from the Crimea. In her book, Ebba describes how they visited the sick and dying but could do little for them. Many had frostbites with resulting gangrene which led to their deaths. The sisters helped the soldiers write their last letters to loved ones at home. Florence Nightingale. Colored Lithograph by J. A. Vinter. Credit: Wellcome Library, London. Florence Nightingale also asked Lady Alicia Blackwood and the Almroth sisters to look after the women and children who had accompanied the soldiers and lived “in the most abject misery” in dark cellars next to the hospital – around 260 women and babies. 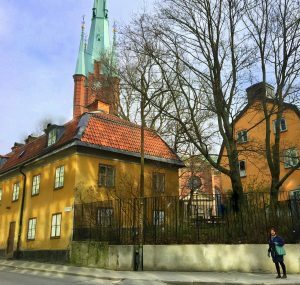 Ebba writes about some of the women that she overheard conversing in Swedish. Ebba’s book, which is available online and written in English, is fascinating. It describes the sisters’ daily work during the war but also Ebba’s life after the end of the war. Once peace was proclaimed, the sisters and the Blackwoods took a steamer from the Bosphorus to visit Crimea and see the battlefields. They returned to England on the 6th of July 1856. Later, she married the Rev. C. H. H. Wright, a distinguished Hebrew and Oriental scholar. His work as a chaplain took them to Dresden, Boulogne-sur-Mer, and Belfast. They raised five sons, one of whom became a prominent immunologist – Sir Almroth Edward Wright. 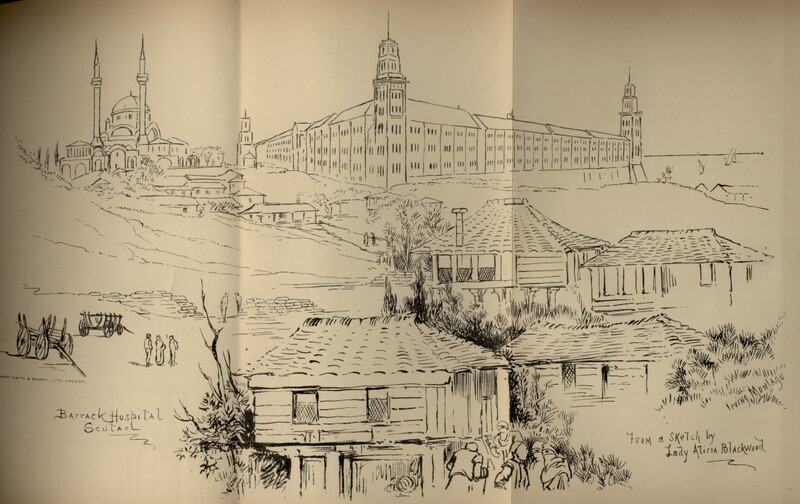 Lady Blackwood’s drawing of the hospital at Scudari. Lady Alicia Blackwood also wrote a book, available online, about her experience from the Crimean War: A Narrative of Personal Experiences and Impressions During a Residence on the Bosphorus Throughout the Crimean War. Throughout the book, she also writes about Emma and Ebba. “Thus ended our Eastern sojourn; and before closing this narrative, it remains to state that our two Swedish friends, Emma and Ebba Almroth, so frequently mentioned, were both after our return to England happily married to clergymen. Emma and her husband had one son and three daughters. 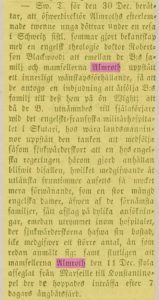 Obituary written by Ebba Almroth on the death of the Swedish princess, Eugénie, published in Sunday at Homes, September 1889. Did Augusta also know the “old schoolfellow” Adèle Marina Rudenschöld? I bet she did!